Another day, and another hack. This time, the latest victim appears to be online travel company Cleartrip. Its website was hacked briefly on Monday, and a group called Turtle Squad took the responsibility for the hack - which saw the website defaced. News of the defacement of Cleartrip's website was first brought to light by an eagle-eyed Twitter user, with a screenshot of the defaced website. The screenshot featured the message "Roses are read, violets are blue, all your security is up to you. We Are Turtle Squad Got It?" was put up. The hackers also took a dig at the website's security, by writing, "Hey! Are you one of those 1.4 crores users? They say you're secure." Upon checking the Cleartrip website, we could not see any defacement. However, the Wayback Machine Internet Archive shows a multitude of edits to the website between 10:08 and 10:42am on Monday, while a Google Cache page of the website from 10:03am shows the defaced page. Another clue was a Google search for the words "Turtle Squad" + Cleartrip, which features Turtle Squad's text in the page description. Someone has written to Cleartrip for a statement on the hacking incident and will update the story in case they receive a response from the company. If the hacking group's claims are to be believed, then details of 1.4 crore users may have been compromised - though, the hackers may only have been referring to how easy it was to deface the Cleartrip website. Cleartrip started off its operations in 2006 as an online travel company offering information for easy booking of hotels, flights, trains, and more. Apart from India, Cleartrip is now also available in Oman, Qatar, Kuwait, Bahrain and Saudi Arabia. As for Turtle Squad, not much is known about the hacking group. While the name does appear to be homage to the Lizard Squad, its logo takes inspiration from Pokemon's Squirtle Squad leader. Description: This time, the latest victim appears to be online travel company Cleartrip. 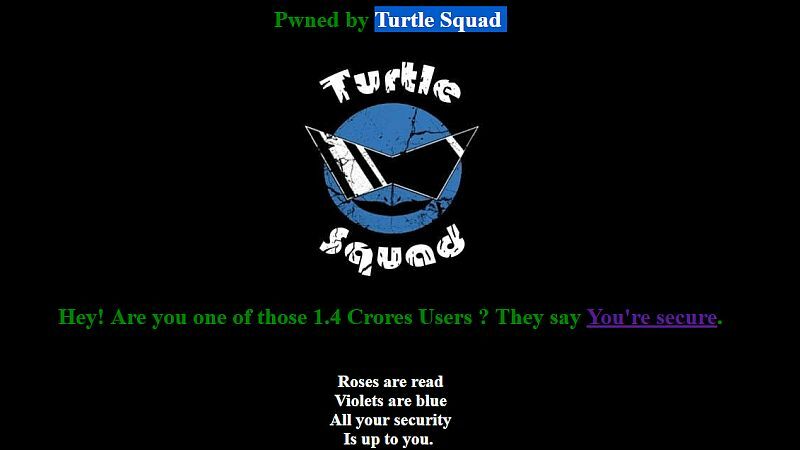 Its website was hacked briefly on Monday, and a group called Turtle Squad took the responsibility for the hack - which saw the website defaced. 0 Response to "Cleartrip Website Apparently Hacked by 'Turtle Squad'"